What would the perfect pro sports career life cycle look like? It should begin auspiciously, with a high draft pick. That promise should then be followed up by a performance to match, with passion and eye-popping numbers to go along with the star turn. There should be personal accolades (All-Star Games and MVP awards) and team achievements (winning seasons, playoff appearances, and a title) all of which silence hordes of critics who were present throughout. The narrative needs some kind of struggle, after all. Assuming the above boxes have been checked, how, then, would the perfect career end? This is the really tricky part, the part that almost by definition can’t be perfect, the part that no one ever thinks enough about. There’d have to be some sort of guaranteed security and a day-to-day appreciation that exceeds the by-then-diminished ability to contribute on the court. Maybe there’s a reunion with a former coach or GM, maybe there’s a reunion with the team that offered up that first opportunity, and, since we’re using our imaginations, maybe there’s a not-too-far-away chance to become an owner of that team, the one that drafted you. Believe it or not, I kept my home here. I come here every year …. I come here during the summers. I don’t visit you guys in the winter, obviously. The summers, I come back, I’m here. But when it comes to going out and just being in the city and being active, oh man. My friend tried to take me uptown, I didn’t recognize nothing on Highway 7. I was looking, I felt lost, all the shortcuts and frontage roads are gone now. I gotta find new things about the city. But the fans and the people have always been great to me, been great to my family. The experience here is always going to be the origin. Garnett is in his 20th NBA season, and, for me, the most interesting way to measure that stretch is by the sheer amount of criticism he’s outlived. Ahead of the 1995 draft, as he was poised to become the first player in 20 years (shouts to the immortal Bill Willoughby) to jump from a high school gym to an NBA arena, Garnett was labeled “NBA Fool’s Gold.” Zach LaVine, meanwhile, was 3 months old. In 1997, after Garnett signed his six-year, $126 million extension, the classic “too much too soon” line of criticism, which often appears when young athletes get money, took the form of his pizza delivery guy tipping habits. Garnett’s new contract extension, a six-year deal for $125 million, works out to about $254,000 a game. “At a rate of $20.8 million a year starting in 1998,” writes Sansevere, “Garnett will be paid an average of $400,000 a week, $56,986.30 a day, $2,374.43 an hour, $39.57 a minute and 66 cents a second. Eighteen years later, you can still smell the resentment wafting up from those lines, just as sure as you can smell the hot pizza. I wonder what then–Minnesota Twins second baseman Chuck Knoblauch’s tipping habits were. Someone find the golf caddie he stiffed that one time. When the Wolves were swept by the Mavericks in 2002, back in the old best-of-five days, Charles Barkley and Magic Johnson, among others — actually, among seemingly everybody — criticized Garnett for not stepping up in the clutch. KG averaged 24 points, 18.7 rebounds, five assists, and 1.7 blocks in the series. At the time, Andrew Wiggins was 7 years old. Q: Word on the street is that you’re soft in the fourth quarter. KG: F​-​-​- you talkin’ about? That’s not what I hear. Q: What do you hear? KG: That KG is the m​-​-​-​-​-​-​-​-​-ing s​-​-​-. N​-​-​-​-s know. My peers in the league know what I’m about. Q: What have you learned about the fourth quarter? KG: To not pass the ball if we’re losing. Criticism comes with the game, and the volume only increases with the zeros on the paychecks. Magic was called Tragic Johnson. Jordan was considered a one-man show. LeBron was also derided for not being clutch, and so forth. The difference is that Magic had Kareem and Worthy; Jordan had Pippen; LeBron climbed the mountain with Wade and Bosh. Garnett was running around for a bunch of years with Wally Szczerbiak as his second option, Rasho Nesterovic as his center, and Anthony Peeler bringing the fire off the bench. If anyone wasn’t stepping up, it was the Timberwolves front office. In 2003-04, Kevin McHale finally managed to assemble a worthy team around KG with the additions of Latrell Sprewell and Sam Cassell. Garnett was named the league MVP after averaging 24 points, an NBA-leading 13.9 rebounds, five assists, and 2.2 blocks while recording a 29.4 PER. The Wolves won 58 games, finishing in the top 10 in offensive and defensive rating for the first time in franchise history. It’s Game 7, man. This is it. It’s all the marbles. Sitting in the house, I’m loading up the pump. Loading the Uzi. Got a couple M16s. Couple nines. I gotta couple joints with the silencers on ’em. I’m just loading up clips. Couple grenades. Got a missile launcher with a couple, you know, missiles. I’m ready for war. War metaphors aside, Garnett was incredible in the entire Sacramento series, just like he had been in the previous seven disappointing first-round exits. 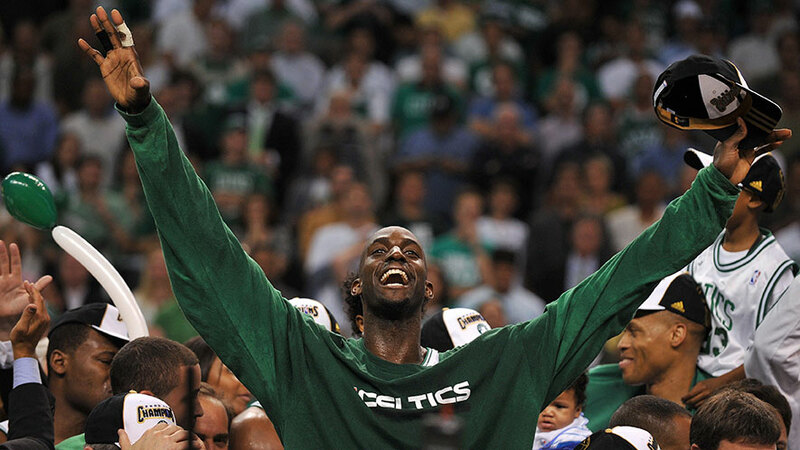 In the clinching game, on his 28th birthday, KG simply did what MVPs do: everything. He handled the ball, ran the offense when Cassell sat, and owned the paint to the tune of 32 points, 21 rebounds, five blocks, and four steals. He also came up in the clutch, crushing a straight-on 3-pointer with the shot clock running down to push the Wolves’ lead to seven with less than four minutes to go. The success didn’t last, of course. Within a year, Wolves owner Glen Taylor was referring to the acquisition of Cassell and Sprewell as “a failed experiment.” McHale fired Flip Saunders in the middle of the 2004-05 season. Minnesota ended up trading Cassell and a conditional first-round pick in a disastrous deal for Marko freaking Jaric. Sprewell declined Minnesota’s contact extension, sleepwalked through the 2004-05 season, and faded away into memory. This is how the Wolves rewarded the players who contributed to their best season ever. They have not reached the playoffs since, and Garnett had to go elsewhere to get his ring. The defining characteristic of the Timberwolves throughout their history has been a certain Midwestern provinciality, a preference for the familiar. Taylor brought in McHale, who is from Hibbing, Minnesota, as the assistant GM and color analyst. McHale eventually ascended to team vice-president, and when he needed a coach, he turned to his old University of Minnesota teammate Flip Saunders. Even when McHale traded Garnett to Boston in 2007, he traded him to the team he used to play for, a team helmed by his friend Danny Ainge. That resistance to change is the only explanation for why Taylor held off on firing the immortal David Kahn for so long. 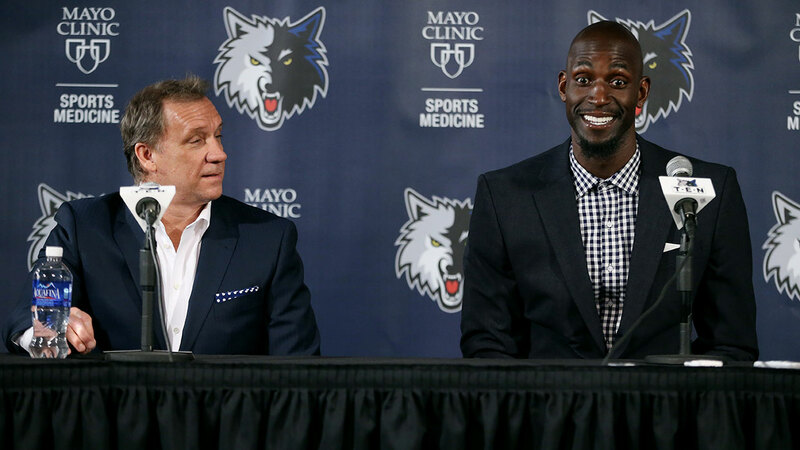 Once Kahn was mercifully let go, who did the Wolves turn to as their new head of basketball operations? Flip Saunders, who, in turn, hired some guy named Flip Saunders to be the coach after an extensive search that included looking in the mirror. The Timberwolves have the sixth-youngest roster in the NBA. LaVine and Wiggins can’t legally buy alcohol. Gorgui Dieng is promising but raw as sushi. Anthony Bennett is an existential tweener with no idea how to play and one foot in the D-League. And so it logically follows that when part-owner/GM/coach Saunders looked at his players and decided they needed a mentor, he would turn to Garnett. At 38 years old, Garnett is a shadow of his former basketball self. An honorary member of the “Hate Him Unless He’s On My Team” Hall of Fame, as his skills have faded, Garnett’s legendary competitiveness has ripened into a distinct dirtiness. Still, his 3.36 defensive real plus-minus mark is good for seventh-best among power forwards and 18th-best overall. He never, ever, ever stops talking on defense. And what opposing player wouldn’t still worry about post positioning with KG ready to sink his incisors into the fleshy part of his forearm? How will LaVine, Wiggins, Ricky Rubio, and the rest react to this ancient maniac barking epithets that some of them may not even understand, throwing their cell phones in the toilet, and yelling at them in the huddle until they cry? Can Garnett complete the perfect NBA life cycle?